WHY AM I A NATURAL LITERACY ADVOCATE? As a family member, you know your child best. You have seen your child’s literacy skills progress over time. Your child may confide in you about his feelings, successes, and challenges in school. You may notice important learning behaviors that the teacher does not, such as not wanting to go to school or do homework. WHAT IS A LITERACY ADVOCATE? Literacy advocate supports or speaks out for someone else’s educational needs or rights in reading, writing, and language. When you advocate, you may focus on one child’s needs, issues for many children, or ways to teach and learn. When families and schools work together toward common goals, children make better progress. By sharing information with one another, you can develop a plan that best addresses your child’s literacy needs. You and the school view your child through different lenses, yet both viewpoints are equally important. Be ready to explain your child’s literacy struggles and what supports and instruction will help him learn. Your ideas matter because you know your child and you are your child’s voice. WHAT SHOULD I ADVOCATE FOR IN READING AND WRITING? What screening practices for literacy does the school use and when? How are children with reading difficulties identified? What evidence-based literacy instruction and interventions are used? What information does the school collect on my child’s literacy progress? How is the information used to make decisions about my child’s literacy needs? What types of support are offered to my child if he or she is struggling to read or write? What accommodations does the school provide to help my child read or write? 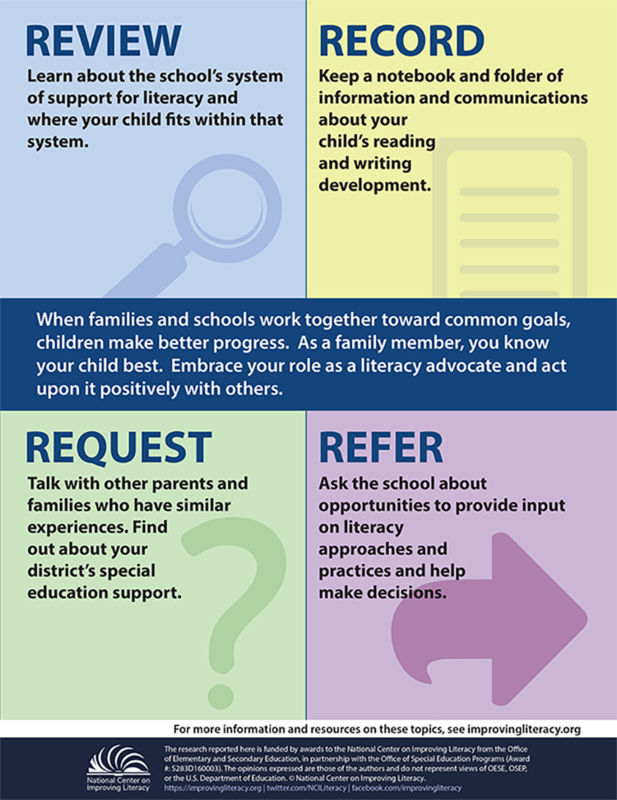 HOW DO I BECOME MY CHILD’S LITERACY ADVOCATE? Review: Learn about the school’s system of support for literacy and learn where your child fits within that system. If your child is receiving special education services, ask for a copy of his school records and know your educational rights and responsibilities. Record: Keep a notebook and folder of information and communications about your child’s reading and writing. Note what was discussed during calls and meetings with the teacher or school. Write down dates, times, topics, decisions, and next steps. Request: Talk with other parents and families who have similar experiences. Find out about your district’s special education support, like special education advisory committees, and attend PTA meetings to learn about opportunities to connect with others. Refer: Ask the school about opportunities to provide input on literacy approaches and practices and help make decisions. Request workshops and engagement activities that bring the school, home, and community together to learn about reading and writing instruction. WHAT IF THE SCHOOL AND I ARE STUCK? If you find that you are having trouble understanding information or school processes, or you think you are not getting answers, you may want to seek outside help. For example, reach out to your state’s parent training and information center (PTI) or a Community Parent Resource Center (CPRC) or a protection and advocacy group (P&A). A professional can provide advice and support. You might also consider a friend who can attend meetings with you to take notes and help you represent your child’s interests. Toso, B.W. & Grinder, E.L. (2013). Engaging parents in meaningful roles: The benefits of parent leadership activities for family, school, and community. In B.W. Toso (Ed. ), Proceedings of the 22nd National Conference on Family Literacy 2013 Research Strand (pp. 104-111). University Park: PA.
Trainer, A.A. (2010). Diverse approaches to parent advocacy during special education home-school interactions. Remedial and Special Education, 31(1), 34-47. This video from the Launching Young Readers series describes how parents can be empowered to get help and support their children in learning to read. This guide will help you build your child's literacy skills at home, recognize signs of trouble, support your child as she enters school, and more. This guide provides an overview of the Response to Intervention process, describes how it is implemented in schools, and offers questions that parents can ask.